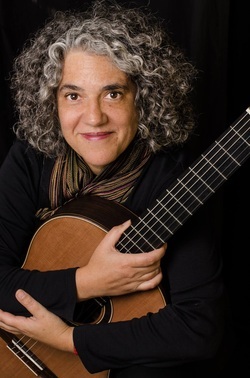 Hailing originally from Colombia, Maria Olaya is a classical guitarist, music teacher, composer, and arranger who draws from many years of experience and a wealth of musical knowledge. Maria has performed and taught around the world, including appearances in Colombia, Germany, and all over the United States. A frequent and active performer in the Pacific Northwest, Maria has played twice as the featured guitarist for the Portland Guitar Society. For many years she performed with Duende, a Brazilian music trio, and every spring Maria performs at the Northwest Handmade Instrument Show, which features performances on beautifully crafted guitars of all kinds. She can also be seen performing regularly with guitarist Peter Zisa and the choral ensemble Sing Portland. Maria's solo guitar album, Pertenencias, was released in 2008. Maria holds a solid foundation in classical music, which allows her to help people explore their own musicality in different types of guitars and styles of music. She teaches all levels of guitar, striving to partner with each student to learn to play the music they love. Maria works regularly with students to play classical, rock, blues, folk, pop, flamenco, and jazz styles, as well as singer-songwriters and band members. She plays and teaches nylon string, steel string, and electric guitar. Maria holds a Master of Arts in Guitar Performance from the University of Miami. She has previously served as guitar instructor at Portland Community College and the MacPhail Center for the Arts.